Few people travel to ‘The Land of the Thunder Dragon’, despite it being voted one of the world’s top destinations. Sitting high in the Himalayas, between Tibet and India, the Kingdom of Bhutan has remained quite hidden away. The doors were only recently cautiously opened for travellers to this Shangri-La shrouded in myth, where sacred monasteries cling precariously to sheer cliffs, colourful prayer flags flutter on high ridges, and red robed monks chant day and night. Almost unaffected by the influences of the modern world, the traditional way of life, guided by the inherent belied in Buddhism, continues virtually unchanged to this day. Having never been colonised, traditional Bhutanese society is still characterised by small scattered communities living in isolation with little contact with one another, and retaining a strong sense of individualism. 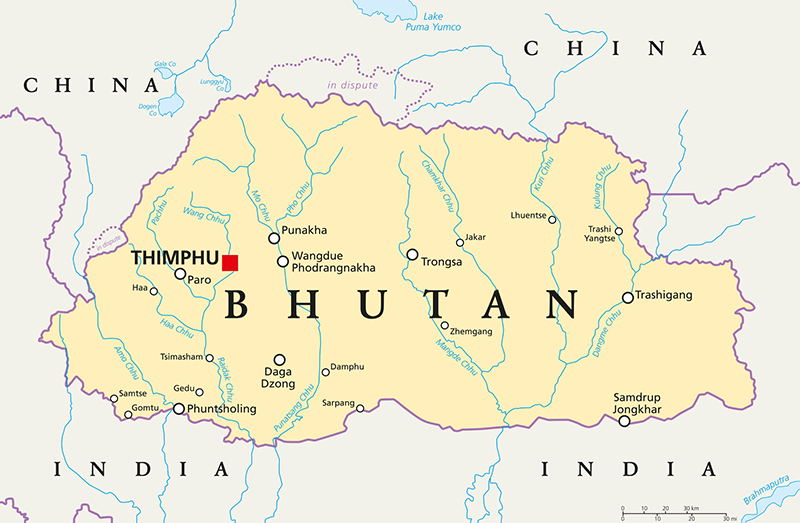 (The first road for motor vehicles, linking Bhutan to India, was not built until 1961). Bhutan is home to abundant bird and wildlife – rare and exotic species such as Snow Leopard, Black Bear, Tiger, Musk Deer, Blue Sheep and the Takin – the Bhutanese national animal – can be found here. The scenery is amazing with sweeping wide valleys and fast running rivers surrounded by dark brooding mountains with their jagged peaks. Visitors can participate in archery tournaments, sing and dance through day and night at the religious tsechus (festivals), trek to the fantastic monasteries, cycle along the highest road passes over 12,000ft, or walk the hillsides, ablaze with colour of myriad wildflowers between March and May.